Quora is the galaxy of answers where we can dig multiple answers for the single question. This is the only source where we can find a solution for each question throughout the world. 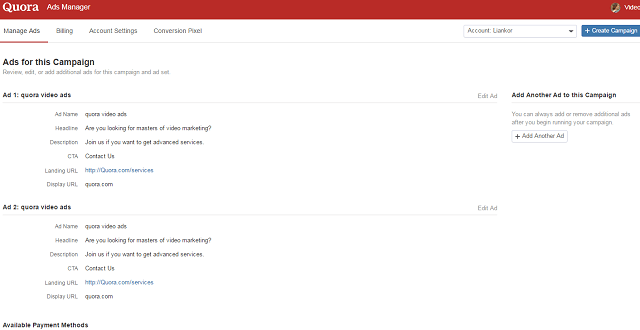 This allocates different categories of questions where we can merge our YouTube videos to make promotions. The only theme of this Quora is to make a strong relationship between the users of Quora through unbreakable communication. As Quora is providing the highly qualified information from the good profiles everyone is approaching it to acquire the required data. Hence, this will be the major trending platform to explore our business by making promotions through the medium of YouTube videos. 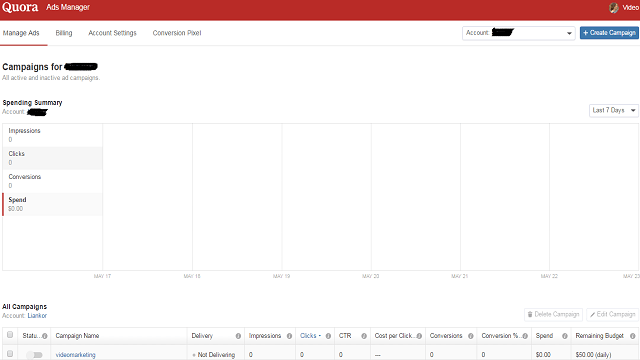 Through Quora Ads, the ROI can be quantified easily and by using ads manager the views can be measured. With the help of conversion pixel conversions can be calculated. When you create your ad account then immediately you will be directed to the ads manager where you can find manage ads, billing, account settings and conversion pixel. By using conversion pixel you can find the number of conversions obtained and the number views generated for that particular ad. Ads manager will disclose the status of your campaign containing delivery, impressions, clicks, CTR, cost per click, conversions, spend amount and remaining budget. 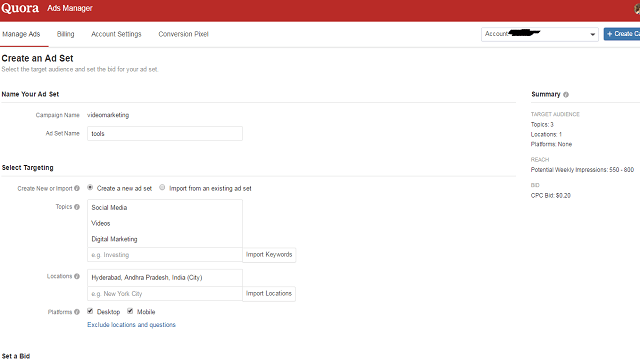 After login to your ads manager account, you need to click on create a campaign by entering the name of your campaign, daily maximum budget and schedule to play the campaign. Now its leads to create an ad set. 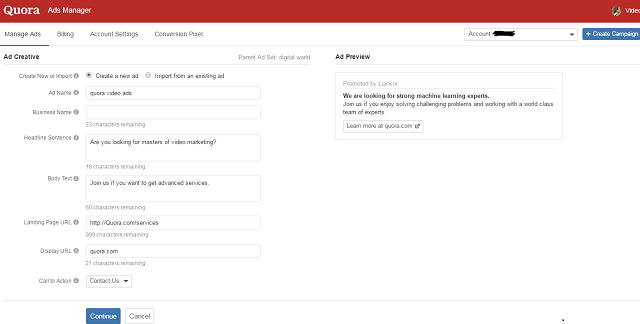 Here you should fill the blanks consists of naming your ad set, select targeting of topics, locations and platform of devices like mobile or desktop where you are expecting more users of Quora. Assign bid value for the ad you set. After that hit on continue and this directs to create a new ad. In this page, you need to generate the headline, description and URL for your ad including the boost button for your ad like Call-To-Action containing multiple options. Choose which one you need and then click on continue button. Then you can find ads for this campaign. The overview of your ad campaign will be displayed containing the ad name, headline, description, CTA, landing URL and display URL of your ad. 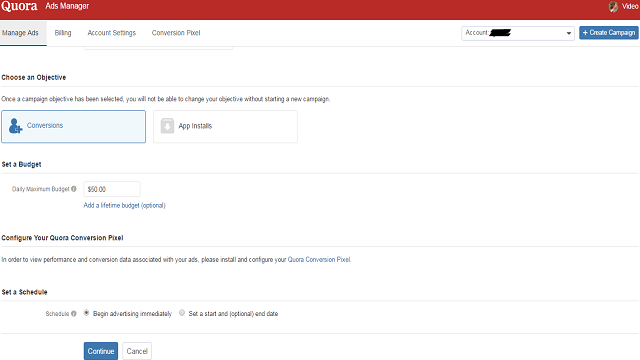 The payment option will be shown to pay a certain amount to Quora about that campaign. 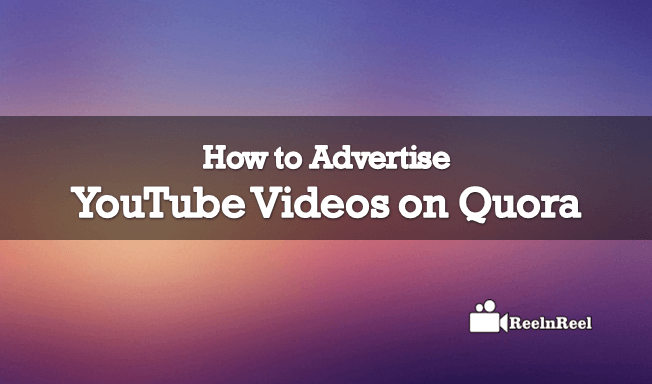 This is the only article where you can provide the brief information about the launch of YouTube video ads on Quora which drains huge traffic. After the implementation of Ads on Quora you will find a drastic change in your business. How to use Disappearing Video for Social Media Brand Building?